Fill out this brief form to learn more from one of our admissions counselors. If you are a current Green Mountain College student who would like more information, please fill out this short form and an admissions representative will contact you directly. Applying will enable us to fully answer your questions about credit transfer, program placement, and cost. If you are ready to apply, only application and GMC transcript is required. Please use our Castleton Application to apply. Mark yes to the fee waiver question. For those unable to submit online, Castleton's paper application is available to print. Paper applications can be submitted via fax: (802) 468-1476 or via email. 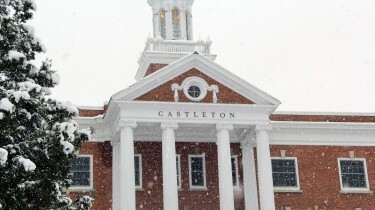 Castleton University, part of the Vermont State Colleges System (VSCS), announced on January 23 that it has reached a teach-out agreement with Green Mountain College that ensures many of the students impacted by Green Mountain’s impending closure will be able to complete their degrees at nearby Castleton. Castleton will accept all currently-matriculated students who are in good academic standing at Green Mountain. The University will also provide a financial aid package that will allow current GMC students to attend Castleton at a net tuition price that is equivalent to what they paid in 2018-19, so long as the rate does not fall below Castleton’s in-state tuition rate. Additionally, Castleton will waive all application fees and provide an expedited transfer process that will allow GMC students to seamlessly transfer to Castleton. The University will host several information sessions to help Green Mountain students navigate the transfer process, beginning this week. On January 24 and 25, Green Mountain students are invited to the Castleton campus, with no appointment necessary, to meet with admissions representatives. On Saturday, January 26, Castleton will welcome GMC students at 10 a.m. [REGISTER HERE] and 1 p.m. [REGISTER HERE] to group information sessions and admissions representatives will be on the Green Mountain College campus at a date in the near future. Please see our Visit Page for additional opportunities. Castleton admissions representatives will be visiting the Killington School of Resort Management in the near future to ensure all students pursuing their degrees through the unique program will remain on track to completion, pending approval from the New England Commission of Higher Education (NECHE). The three-year resort management program utilizes a cooperative model in which students attend classes as traditional students, and also receive credit for working in paid positions at Killington. Castleton will begin accepting applications from GMC students immediately.